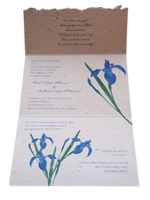 GreenFieldPaper.com is a manufacturer of plantable invitations that are embedded with seeds. This line includes modern design infused with earth friendly products that are distinctive and perfect for any occasion. See Green Field Paper for all your green paper products.